My husband has recently started eating vegan and there isnt much overlap between what he eats and what I eat anymore. But this vegan kaleslaw is one dish that we both love. It’s super easy, tastes really healthy, and pairs well with so many things! 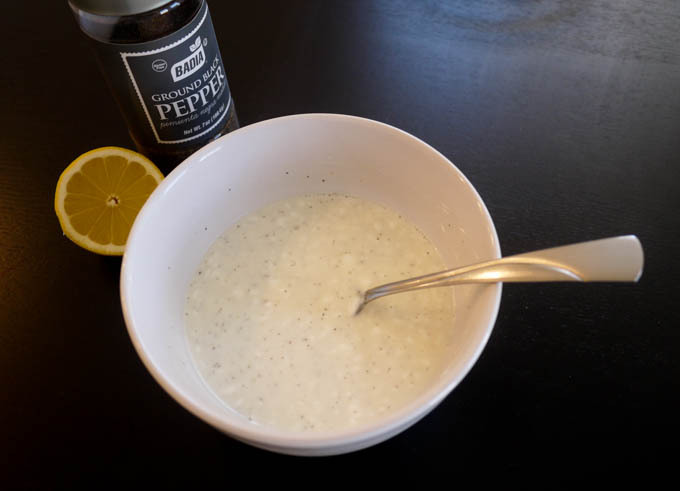 It can easily be made non-Vegan by using regular mayonnaise and whole milk. 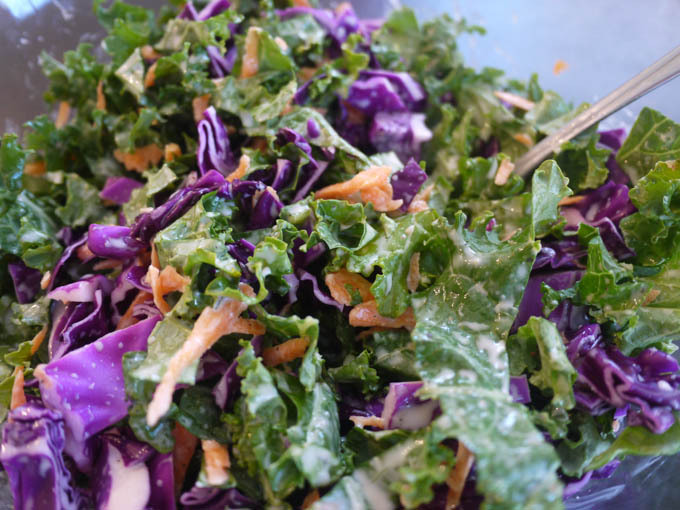 Refreshing vegan "kaleslaw" that combines curly kale, red cabbage, and shredded carrots in a light, tangy dressing. 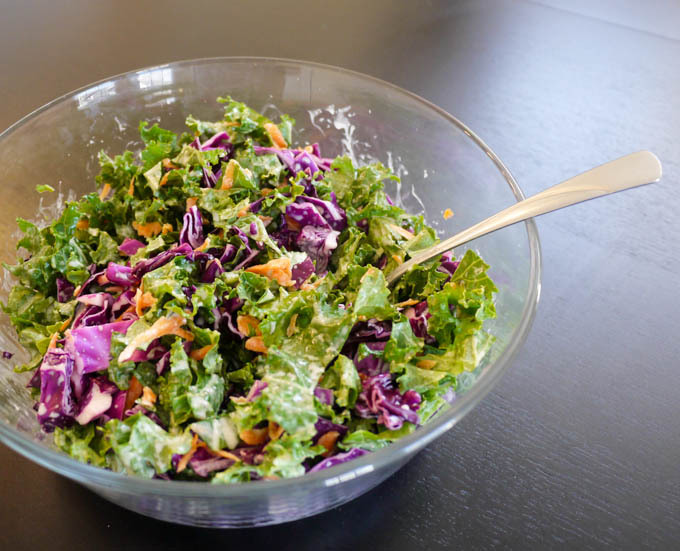 Combine kale, cabbage, and carrot in a large bowl. 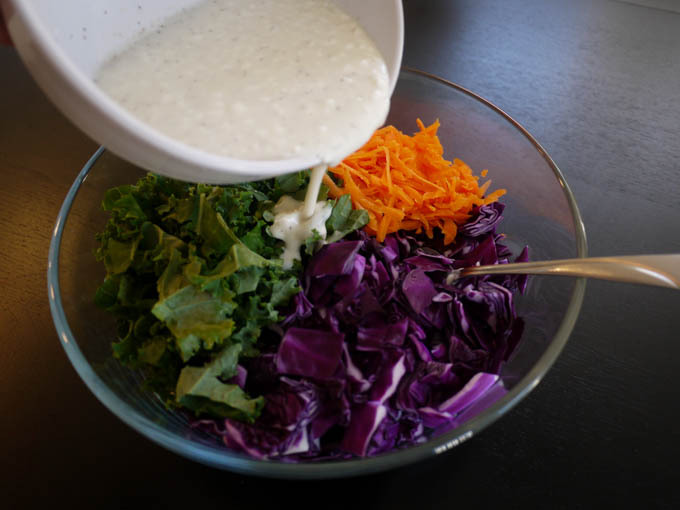 In a separate bowl, stir together vegan mayonnaise, white vinegar, lemon juice, white sugar, soy milk, garlic powder, onion powder, salt and pepper. Pour dressing over the kale mixture. 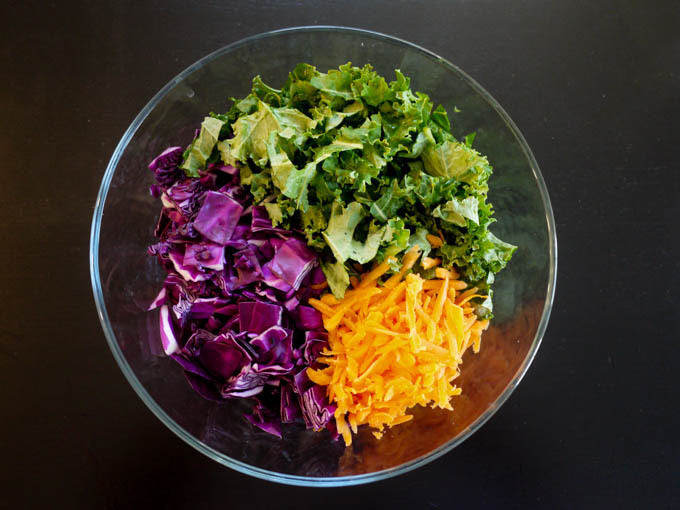 In a large bowl, combine the chopped kale, chopped red cabbage and shredded carrot. Be sure to shred the carrot yourself instead of buying pre-shredded carrots. The dressing soaks into fresh carrots better. Combine the remaining ingedients in a small bowl. Don’t worry about smoothing out any lumps. The dressing will be somewhat thin. 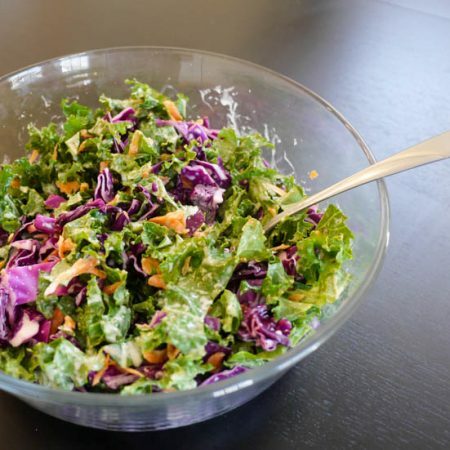 This gives the dish a refreshing taste and lets the bold flavors of the kale and cabbage really shine. Pour the dressing over the kale mixture. 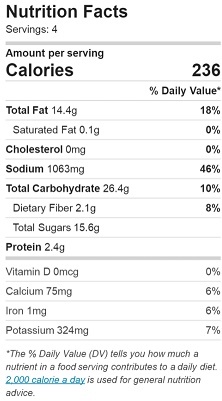 This tastes sooo good and you can eat a ton of it and not feel weighed down. It goes well with other really strong flavors like grilled chicken, soy chorizo, and baked salmon. I wouldn’t eat this with something really mild like grilled tilapia or you won’t be able to taste it over the kale. Because the kale and cabbage are so hardy, you dont have to worry about this wilting much in the fridge. Not that it will last that long in there anyway!